On Monday, February 4th, 2019 the Underground received confirmation that SCSYou presidential hopeful, Anup Atwal, was disqualified from the 2019 SCSU general election. Atwal was disqualified due to being issued 45-demerit-points by the Chief Reviewing Officer (CRO). As per the SCSU elections procedure code, executive candidates are only allowed a maximum of 35 points. The following is an overview of the timeline of Atwal’s received demerit points – and a host of other related events surrounding the 2019 elections. 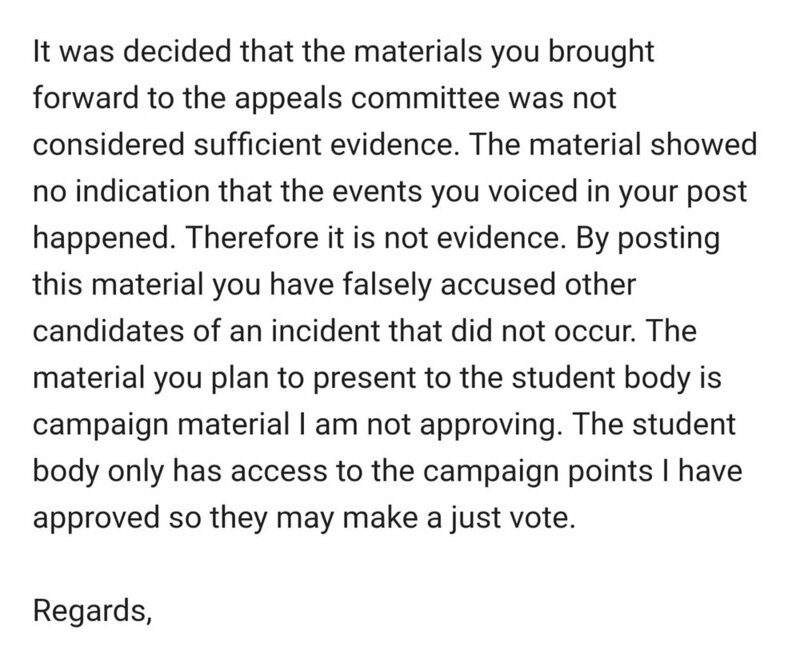 b) 15 points for accusations contained in the post regarding elections processes and candidate-related incidents. This series of incidents has been dubbed by our editors as tablegate. Events surrounding tablegate are hard to decipher and fully understand. 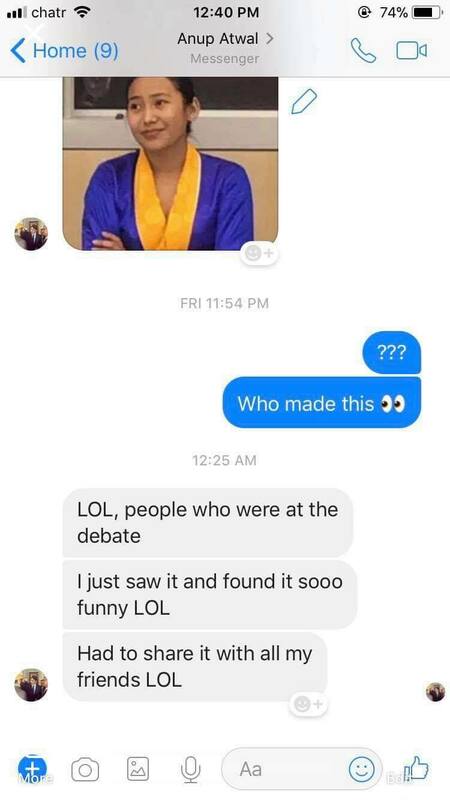 Depending on who you talk to, either ShineBrightUTSC presidential hopeful, Chemi Lhamo, struck SCSYou vice president of academic and university affairs (VP-AUA) candidate, Carly Sahagian, with a table; or Sahagian attempted to disrupt campaigning by falsely claiming that Lhamo struck her. According to the CRO, the evidence provided by Atwal did not support his slate’s claims. The Underground was also able to obtain video clips taken after the incident, which contain the testimonials of nearby students and the candidates themselves. In one video, Sahagian accuses Lhamo of striking her. In the next, two groups of students claim that Lhamo never did. It’s important to note that in the latter video, the second group of students contains an unidentified student and Raymond Dang, ShineBrightUTSC’s VP-AUA candidate. The Underground reached out to the CRO and the SCSU for an official comment at the time but received none – in fact, none of our election related requests have been responded to. b) a gross misrepresentation of the facts (20-demerit-points). As per the image obtained Tuesday via the display board inside the SCSU office, this officially brings Atwal’s demerit points above the limit allowed for an executive candidate and disqualifies him in this week’s election. According to the candidate himself, he had appealed the decision and it was turned down. Lhamo and Dang also received demerit points for their conduct during the Underground debate. Dang most likely received the demerit points related to his comments regarding another candidate’s qualifications for their role – docking him 25 points; and Lhamo, most likely for her comments surrounding the leaking of campaign points and a candidate’s relations with the LGBTQ+ community – resulting in a 25-point penalty. On the other hand, Lhamo challenged Atwal’s sympathies towards LGBTQ+ peoples and claimed that the SCSYou slate had received ShineBrightUTSC’s campaign points and insider information about their campaign. In an interview with the Underground, Atwal confirmed that he did indeed have access to ShineBrightUTSC’s campaign points. However, he states that he received them hours before posters were set to go up and never incorporated any of the opposition’s points in his slate’s platform. Atwal highlights that his source was not Sahagian, a former member of the opposition, but rather a current executive candidate on the ShineBrightUTSC slate who gave him access to their poster. He stresses that Sahagian left the opposition’s slate due to a negative and untrustworthy environment and that there was only one instance in which she brought up a single campaign point of ShineBrightUTSC’s, but it was not integrated. Atwal highlights that his team’s posters had already been sent to the CRO for approval, and thus no changes could be made, nor would he have made them. Atwal went on to say that an executive on ShineBrightUTSC’s slate was continuing to engage in information-sharing activities, but would not comment on who that person is. Lhamo’s accusation suggested that Atwal had access to their campaign points long before the campaigning period had begun. Atwal suggested that the onus was on Lhamo to prove her claim, rather than on him to deny it. Pictures sent to the Underground via an anonymous source show Atwal spreading an image of Lhamo. He denies having created the meme but confirms that he sent it to his close friends. Asked if his behavior was fitting of a president, Atwal said: “someone who slanders you…someone who questions your engagement with LGBTQ community…someone who questions your slate…makes it sound that you’ve stolen their campaign points…someone who accuses my slate to say you’re utterly on qualified for this position. Atwal asserts that if ShineBrightUTSC had not engaged in the aforementioned actions he would have not spread the image.